I know the world is going to hell in a futuristic handbasket — I know this because All Media Tells Me So, and who am I to question all the signals. But I can’t help but note that I’m really happy at the moment. I guess I’m always fairly countercyclical in my weltanschaung vs the zeitgeist: others have noticed how much I perk up at the sign of a recession. I don’t remember being exactly happy after the financial crisis, but I wasn’t that gloomy either. Anyway, things are pretty calm for me. I’m recently, cheerily, married. My work and co-workers continue to amaze me. I’m — even as I type — livestreaming my screen and blurred, nighttime webcam face onto Twitch, which as I mentioned below, seems to work wonders for my sanity, if I’m not too jittery and nervous to do it. I like the quiet companionship of the world right now. It’s all hubris, of course. Just writing this is inviting the Gods to trash my backups, evict me from my home, and smother me in my own just world fallacy. But that’s always going to be the case. I can be hubristic with my mouth shut. I can be hubristic with a half-smile. I had a list of new year’s resolutions this year, which I wrote and then forgot about, but at some level have been trying to complete ever since. Let me dig them up; hold on. Ah, here they are. Well, I’m not losing any weight, but I am managing to live stream pretty often. I share a weird corner of the streaming world, where amateur programmers show strangers their screens and their faces while they do random coding. Mostly it happens on Twitch TV, which has cornered the market in esports and mass live video demonstrations of gaming prowess. Twitch TV also streams the long tail of what it used to call “Creative” — enthusiasts building PCs, drawing pictures, messing with clay, and growing chickens. After a mixed beginning (where you could see Twitch trying avoid turning into a video sexworker marketplace, or just troll central), Twitch has clearly developed a fondness for these corner cases. Maybe it’s because they hark back to when it used to be Justin TV, and people showing you things they did was all it had. Anyway, I’m hovering at the bottom of the “Science & Technology” category(! 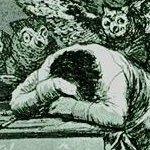 ), a long way away from the 13 million followers of gamers like Ninja, and honestly a fair bit below popular coders like Al “The Best Python Teacher I Know Of” Sweigart, game developers like ShmellyOrc, and even other Lisp-exploring streams like Baggers and the mysterious algorithmic trader Inostdal. It’s okay though. I’m doing this for my own entertainment and sanity: livestreaming, for reasons that I’m still trying to understand, snapped me out of depression a year ago. (It’s not called Code Therapy for nothing.) Plus I’ve always enjoyed playing to small rooms, if they’re full of good people. Anyway, as they say, subscribe and follow, follow and subscribe. Set it up to notify when I’m streaming, and come sit with me sometime. We’ll have a safely mediated chat, through protocols and stacks and obscene amounts of bandwidth. I’ve been futzing around with LISPs. See how we say LISP like that, all in caps? That’s how I think of Lisp; it has this vague aura of pre-1980s aesthetic where capital letters where either teletype-obligatory, or an actual indicator of futuristic COMPUTER WORLD. Case in computing is a funny thing, like a binary signal in the ebb and flow of fashion. When and why did Unix (UNIX™) shell commands adopt that lowercase chic? I still write my email address in lowercase, even on government forms that request all caps, out of a defiant alt tone — DANNY@SPESH.COM stinks of AOL, Compuserve, and doing it wrong. Common Lisp, forged in the eighties, expected, like Lisp itself, to be timeless: Common Lisp has CAPITALS all over it. Not exclusively, though. I guess when you’re Guy Steele and you’re trying to bind together futuristic AI and McCarthy fifties experiments, smashing together upper and lowercase is the least of your temporal concerns. Will upper case make a come back? MAYBE IT ALREADY HAS. I love this articleby Christine Peterson about her coinage of the term “open source”, not just for the story (which I’d known about, but never heard in detail), but for the tone of the piece. It’s written in what I generally think of as “Geek Old Semi-formal”: this precise, slightly low-affect, somewhat wry tone that seeks to depict the maximum number of factual points, in a simple but almost shockingly accurate way. In pretty much everything I’ve done, I’ve fought with the hellish triangle of being readable, entertaining, and truthful. Sometimes you end up flexing the absolute clinical truth for one of the others: for instance, I don’t really “generally think” of Christine’s tone as “Geek Old Semi-Formal”. I just made that term up on the spot. I didn’t quite confess that earlier, because it sounded funnier to imply I’ve used this name, even just internally, for years. Anyway, where was I? Right: so, actually honest documents are rare, mostly unentertaining and largely unreadable. We rarely optimise for the absolute truth, because either one of “readable” or “entertaining” is more immediately valued, and rewarded. Geek Old Semi-Formal is readable and true, at the expense of some of the fripperies of language that we associate with entertaining speech. It’s this beautiful upgrade of technical writing to convey conversation, stories, anecdotes, and the communal trivialities of our lives. I don’t want to say that computer geeks got this from Kernighan; I think that there’s a wide set of folks involved in factual-seeking professions and hobbies that hold similar aspirations, and end up admiring and adopting the same style. This morning, I opened a mystery package delivered by the “browsing ebay auctions at 3AM”-fairy. 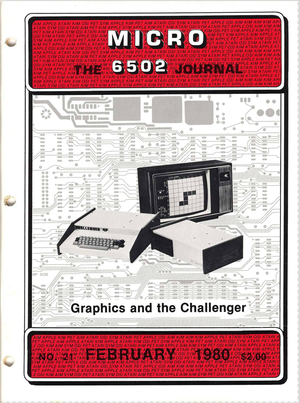 It was a paper copy of this February 1980 issue of MICRO: The 6502 Magazine purchased for reasons of unstoppable nocturnal nostalgia. I think even the august editors of MICRO would concede that the writing skills of its contributors were pretty variable. The year 1980 seems to be a seller’s market for 6502 periodical literature: There’s a full-page advert pretty much begging for people to write articles. (They’re paying $50-$100 a page, too, if you want to go back in time.) But for me, that variability is just a great opportunity to watch the Geek Old Semi-Formal style fail and crumble in different ways. The feigned jocularity! The laundry lists! The science paper formalism! I won’t point fingers, but you can flick through this copy of MICRO to see for yourself the rich panoply of Geek Old stylings. It’s also a style I really have come to enjoy in face-to-face interactions too. There’s just something deeply comforting about sitting and talking slowly and precisely with someone, each of you carefully constructing entirely accurate sentences with little overall variation in tone or pace. Especially by contrast to the usual chit-chat of slapdashing word-sounds together and slinging them out your mouth in order to fill time and show off, between gurning physical expressions and uncontrollable emotional explosions. Not that it doesn’t also work for emotions, too. I think of all the times someone I know has flatly, compactly and desperately clearly conveyed their experiences: remaining calm, grammatical and short-sentenced even as the tears stream down their face, and their life fell apart. I wonder, too, why I associate it with older geeks (older than me, for sure). It smacks a little of the repressed-fifties model of male scientist, though I don’t think of it as entirely gendered; in real life, it seems as strange on men as women. And I see people younger than me adopting it, often comically until they get it right. It’s definitely a bit on-the-spectrum—but I’m not on-the-spectrum and I use it, and aspire to it. Well, now I’ve felt it so strongly in Christine’s great piece, I’ll start looking for it more, in words and in conversation. And now I have a name to call it! I’m 48 years old now, and I’ve never learnt to drive. When I was 17, on a deserted street with big ditches either side, my dad and I discovered that I needed new glasses more badly than I needed to learn driving right then.And since then, the time has never seemed right. Brief windows of driving-opportunity have opened and closed around me. For most of my twenties, I think the collective income of all my housemates could not have paid for a car, and besides, in London, where would we put it? In the sink with the dirty dishes? The move to California was the obvious opportunity. I figured somehow that it would be easier here, and that my people’s collective knowledge of stick shift might give me a head start. I suppose he thought that if he insisted I drive back from the car-lot, I’d finally snap out of my charade. He held himself in horror as I immersed myself in the role of someone who could not drive — only now I was improvising the not-driving extremely quickly and at random things within sight of the El Camino freeway. I think I was his cue to retire. After that, I even avoided driving videogames. In 2010, I looked up a San Francisco driving school that specialized in fearful, phobic or just unnaturally old non-drivers. This instructor was much nicer, and would tell me inspiring stories of previous incompetents who had finally got it together under his guidance. With his careful stewardship, I failed three times, the last time (I swear this is true) before I’d even pulled out of the DMV. The Californian provisional license actually expires if you fail three times, as if you were playing Donkey Kong or something. Really, the only thing all this car-learning got me was enough to understand that car-driving is madly dangerous, barely within the capabilities of a baseline human to master. I’d sit in the passenger seat and watch the driver, like Ripley and the marines watched Bishop play the knife game. At some point, I gave up my dreams of buying a pickup truck and claw back all rideshare debt I’d built up. Instead, I’d tell people that I’d chosen never to learn to drive. Basically, I said, at fifteen I’d anticipated self-driving cars and was just a bit out on the timing. I don’t think I really planned that far ahead — though I did believe as a child that tooth decay would soon be a solved problem, and declined to listen to a bunch of future unemployed doctors tell me to waste years of my life flossing obsolescent teeth. But I convinced myself of this rationalisation when autonomous vehicles began to be a thing. After that DARPA Grand Challenge footage, I knew I was never going to face my demons. I’d be carried to the doors of heaven by obedient robots. I’m not entirely rejecting the idea I could learn one day. It feels kind of wantonly ignorant to defy learning to drive. Plus, I’m learning the ukulele, and it can’t be more difficult than that, right? Actually some of my new skills, like managing a chord change while not dropping the instrument, might even be transferable into the motoring context. But mostly I’m getting pretty good at just accepting my fate, and taking a lot of cabs. Also, I found out on one of those shifty-looking, FDA-unapproved DNA analysis sites, that I actually have a gene which is associated with, scientifically, not being able to get it together in any physical activity more complicated than hopscotch. So if the carbots doesn’t pan out, maybe CRISPR will get me there, faster. I’ve started detecting one of those biological changes that no-one can quite prepare you for, even though their existence is almost a cliché: in this case, the increasing clarity and number of my early memories. In bed, trying to sleep, I can bring up for the first time in decades my old primary school, or the shopping center I’d walk to when I was six or seven. Names like Mrs Turberville, and Tavistock Road pop into my head. When I close my eyes, I move through Street View and View-Master imagery of where I grew up. I’ve always moved, in largely increasing distances, away from where I was born. In 1979, when I was ten, we moved away from my birthplace of Basildon to Chelmsford. Then I went to Oxford, and spiraled around to parts of London, then gravity-assisted out to California in 2000. I’ve been firm all this time that I don’t want to go back. I’ves wanted to go onward, further, never stop. I was pulled toward cyberpunk, fringe technologies and anticipated states. At Ford’s research center in Basildon in 1977 or so, I looked wide-eyed at a vector graphics depiction of a stick man jumping on a rope. I’m staring in the dark in a long wooden garage or shed behind a chip shop, clustered around Eugene Jarvis’ Defender, newly arrived in Essex. I’m sitting in Dave’s room at college, reading William Gibson for the first time, around 1987. They all pushed me away from my current location, into the future, into unexplored space. But my imagination about what forward means seems embedded in the origin, much more than I thought. The first joke that I noticed being played on me was in 2000, when Havenco, the short-lived cypherpunk offshore data haven, opened a few miles off the coast of Felixstowe. If only I’d waited, I could have caught a bus from my hometown to an arcology of sorts. Then I found out that the current wave of dystopian futurism, was being spun and incubated by Warren Ellis, who had stayed in Southend to wrote of the future city of Transmetropolitan. I would have been closer to my fictional vision of the future (undisturbed by reality) in Essex than in San Francisco. My latest foray is a reading as much of Colin Ward as I can. Colin Ward was an anarchist, whose writings I’d never before read, but who was born twenty miles from me. He loved to write and think about the New Towns, the planned communities build after the Second World War. One of them, Basildon, is where I was born and lived until I was ten. It’s always been one of the places I’ve imagined myself running from — and I’m not the only one. When I grew up, the New Towns were a running joke of austerity and dismal modernism, horrible sink estates for the working classes, where they were locked out of newly profitable cities, and made to fend for themselves in barren housing and an unsympathetic paternalistic “development corporations” that planned and ran the city with technocratic disdain. It would be a throwaway line of mine at Oxford to confess my roots. No-one was snobby about it, but I had no interest in defending the place. Colin not only looked for the good in the New Towns, but also saw it under the substrate they were built upon — the sheds and trailers of an older pre-urban Essex that were homesteaded by Londoners so unhealthy and desperate that they’d rather set up a tiny home with no electricity or hot water than and grow their own food, than live off tea and tinned peaches in the slums. “In the first half of the twentieth century a unique landscape emerged along the coast, on the riverside and in the countryside. more reminiscent of the American frontier than of a traditionally well-ordered English landscape. It was a makeshift world of shacks and shanties, scattered unevenly in plots of varying size and shape, with unmade roads and little in the way of services. To the local authorities (who dubbed this type of landscape the “plotlands”) it was something of a nightmare, an anarchic rural slum, always one step ahead of evolving but still inadequate environmental controls. Places like Jaywick Sands, Canvey Island and Peacehaven became bywords for the desecration of the countryside. To everyone else, both the New Towns and the Plotlands, were, and are, eyesores: terrible mistakes in centralized planning, neglect, and urban decay. If they are a celebration of anarchism, it’s only through how they highlight the ability of distant state-planning to make even the worse conditions of humanity more horrid. Here’s an upcoming trailer for a documentary on Basildon, New Town Utopia, kickstarted into existence because no-one else wants to even think about the place. This is as positive a view of Basildon as you can get, I think, and even so, the air of surviving in the face of an experiment gone wrong is clear. What’s left of the Plotlands has an even more lurid modern reputation. When Reddit recently discussed the most depressing place in Britain, they quickly settled on Jaywick, whose holiday homes, now decayed, were typical of the plotlands movement. Jaywick is definitely the new Basildon in terms of being the go-to target for English concern and disdain. It’s the most deprived town in Britain, and a popular tourist destination for media graduates wanting to make documentaries or reality TV shows seeking lurid tales of welfare recipients. I don’t remember any of this: I’d never thought of Basildon or Essex as failed utopias, or heartlands of self-sufficiency. I didn’t like them, for all the reasons everyone gives: the poor urban planning, the lack of opportunity, the oppressive and reactionary politics. When I close my eyes I can see the closeness of the Essex sky, the flat rough land, the soiled concrete and blinking orange fluorescent lights. And wanting to leave. Not wanting to leave my bedroom, but somehow wanting to leave. But it’s great, now my brain is replaying it all for me, to get a chance to see it through Colin Ward’s eyes. Here’s a poor quality digitization of a TV appearance by Colin Ward from the Seventies, talking about the New Towns. I love how he interviews: his quiet questions, his interest in the complaints and praise and the histories of the town’s inhabitants. I can’t tell if his hair is naturally blonde, or that’s the shade the years of nicotine clouds in anarchist printshops got you. 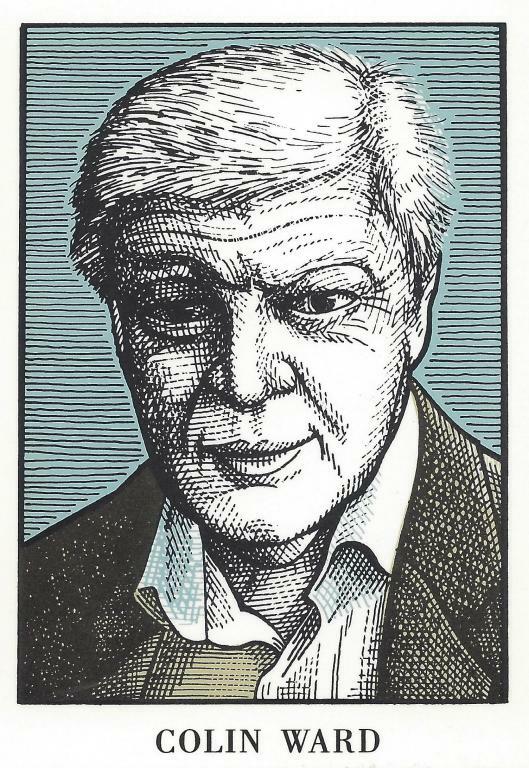 But I want to listen to him more, especially from Italian anarchists who adore him and reprint noble woodcuts of his genial town and country face.